I read The Bell Jar a couple of years ago, in a period when I was super interested (read obsessed) in psychology and mental disorders. Having studied literature at university and not touched on Plath I felt I wanted to read this book for both its content and significance in American literature. 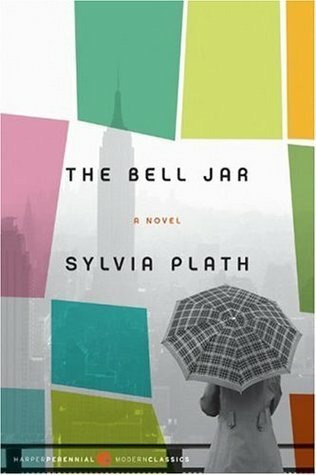 Sylvia Plath narrates Esther's story in a shocking but still realistic and emotional way of how this woman slips into depression and bipolar disorder. We learn about her gradual but total alienation from everything: from society, family, herself. Thanks to the simplicity of the language the story is clear and emotional, with some ironic and funny touches as well. We also learn about the treatments of that time as she stays in some psychiatric institutions, while she falls into suicidal depression fueled by the pressure of society. Set in the New York of the 50s, we find Esther, a beautiful and talented girl who is gradually going down. We learn about her breakdown with such an intensity that we might feel the trouble. We do get inside her head and inner thoughts at her darkest moments. In addition, the book is kind of an autobiography since Plath is writing a story with her college experiences in mind and suicidal ideas. Think about it: you are a beautiful and successful (works in a glamorous magazine) in New York in the era of jazz, parties and new beginnings. You have men and loads of clothes, yet you don't find any excitement in any of that. Feeling empty in an identity crisis. Esther feels society is numb and she is under a bell jar, unable to do anything. Depression is not about being sad because sth happened to you and that's it -you can't find any motivation to do simple things in life, and find it rather difficult to be focused on daily tasks. Dark thoughts run constantly inside your head and you also become quite anti-social in a way that you don't even leave the house. Gender: the book challenges the traditional female gender roles such as virginity, marriage and motherhood. Social Expectation: parental values of 1950 America based on tradition and materialism prove confining for women such as Esther. Identity: Esther struggles with identity issues, which lead her to slip into a depression state. Birth & Death: the main character wants to kill her old self and give birth to a new one. This book is not a walk in the park, but it is certainly very interesting and easy to follow, not messy for me- and especially interesting for those interested in psychology and mental illnesses. Same goes for the ones loving American literature and Sylvia Plath even if they only read her poems- as this is a deep insight into Plath's own thoughts.